So, I’ve started reading novels. Turns out there are some really fabulous books out there! With my “completed-reading-list” as short as it is, I hesitate to lay claim to a favorite genre … but I’m leaning in the direction of Historical Fiction. 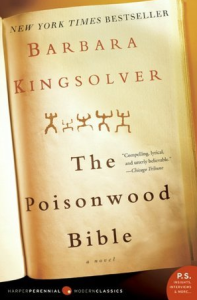 After making short work of Water for Elephants by Sara Gruen, and The Book Thief by Markus Zusak, I read The Poisonwood Bible by Barbara Kingsolver. The story begins in 1959. Fiery Baptist Preacher, Nathan Price, has moved his family from the small town of Bethlehem, GA, to the village of Kilanga, deep in the Belgian Congo, in the hopes that they might win the natives to Christ. The story is beautifully told from the perspective of his wife, Orleana, and his 4 daughters (Rachel, Leah, Adah, and Ruth May). Without giving too much away from the book, I’m so glad the face of missions has changed dramatically over the past few decades. Nathan’s missionary work was about as far from Christ as one can imagine. But that’s not the part of the novel that most captured my attention. One scene in particular, near the end of the book, has affected me. Many years have passed since 1959. Leah is a grown married woman. Her husband is a Congolese man named Anatole. It is January — the anniversary of much sadness for Leah. Anatole speaks. I’ll tell him it’s just as ugly, too, and my skin is about that scaly. I say these things so he’ll argue with me. I’m difficult in January. I know this. I need him to insist that I’m useful and good, that he wasn’t out of his mind to marry me, that my white skin is not the standard of offense. This is marriage. This is parenting. This is friendship. This is being human. I think the reason why I’m so enjoying my new foray into novel-reading is because I’m finding something I didn’t expect. I’m finding profoundly human stories that call to the deepest parts of me, thrusting me deeper into the way of Christ. The way of Jesus, who was so masterful at seeing and declaring the grace and goodness in those around him. And … now I need another book to read! Any suggestions?